After having watched the lovely Up over Christmas, I am now making it my mission to watch Pixar movies. I’ve never been interested in them before as animated movies have never really interested me but they are so beautifully made and funny, I can’t believe I’ve been sticking my head in the sand all these years! I’ve just finished watching WALL-E and I have never seen such a cute film before. But of course the thing I REALLY loved about it are all the Apple references. Pixar, for any of you who don’t already know, was bought by Steve Jobs from Lucasfilm in the 80’s after he left Apple. He then went on to sell Pixar to Disney for an obscene amount of money a few years ago. I’m betting that the Pixar movies are made on Mac Pros, just a hunch. The noise he makes when he is fully charged up is the start-up chime on any Mac. In his house full of stuff he’s salvaged you can briefly see a Mac keyboard. 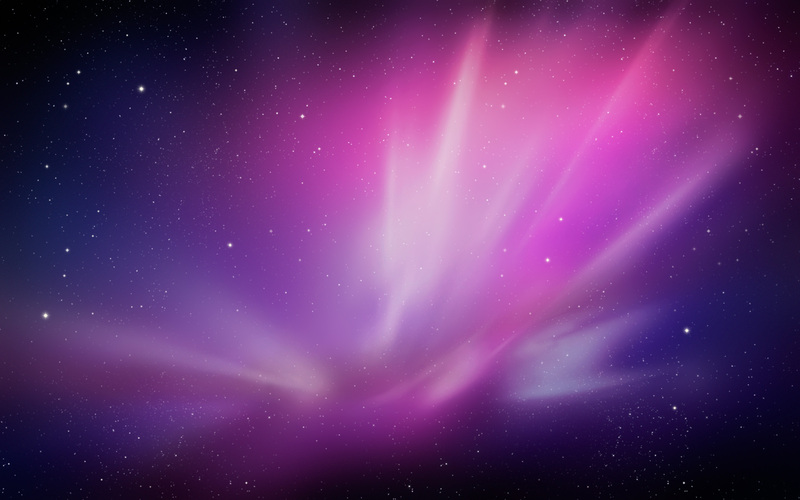 The space colours as he approaches the Axiom craft are the pink/purplish hues of the desktop background in OS X Leopard/Snow Leopard. Again, in space, he flies past the Andromeda Galaxay which is the desktop background for OS X Lion (I know the movie came out 3 years before Lion, but still….). The voice of the onboard computer sounds like MacInTalk, Apple’s old text to speech software. I’m sure there are probably loads more that I missed but I just wanted to share these with you all :D. And if you haven’t seen the movie, watch it, it’s fab. Next Not much to report…. yet. Wall-E is my favorite Pixar movie. Finding Nemo is my second favorite. The thing about Wall-E is that it is very similar to the 80s movie Short Circuit. If you haven’t seen it, I highly recommend, as that was one of my favorite movies as a kid! Thanks! I didn’t use Macs during the Leopard time (although I think one of my old Macs had Leopard, but it had been used previously and it was a clunky old 2006 Mac Mini) so I didn’t really know. Oh, I bookmarked your blog, Bluebell. 😀 And I keep it open in a tab in Safari on my iPhone. Yes, I’m addicted to your blog. I can’t help it. Then again, my LiveJournal isn’t activated, so I have nothing to do but look at your (and Chemicalwib’s) blog. Lol, glad you like it Sugar 😀 Wibs’ blog is gorgeous, I also regularly visit it. Her lots are stunning! Can I just let you and your readers know that my blog link has changed after some problems with subscription renewal? It’s now http://www.galatea0.wordpress.com/. The original link doesn’t seem to work anymore. Happy New Year to you too Galatea 😀 Thanks for the link, I’ve updated it. Also doesn’t EVE look like an Apple product.? Shiny and smooth and white, like an early iPod! Very much like an Apple product! I was reading up about it this morning and Johnny Ive designed her, explains why she’s so sleek with the subtle lights. Yes they are all done on Macs. My family and I are huge Pixar/Disney fans and we spent New Years day watching most of them. Once you watch Toy Story you should check out the other movies again… They hide stuff from the previous movies. (Pizza Planet Trucks and A113) There is other stuff too but I can’t recall all of it at the moment. Oh and Cars has bonus stuff on the DVD where they talk about the computers they had to use because of all the stuff thats in that movie. You haven’t seen Toy Story! Oh no, get to your TV immediately! Just finished watching WALL-E. I personally think it’s the best Pixar movie I’ve ever seen. The graphics were beyond amazing and I love how real it seemed. Also, by Mac keyboard, do you mean the entirely white keyboards that look a lot like Windows keyboards? I did catch sight of those, but not any others. Yep, one of the clunky ones in Wall-E’s home 😉 It’s a beautiful movie isn’t it? I loved it!